Read. Engage. Apply. : You Are Invited! 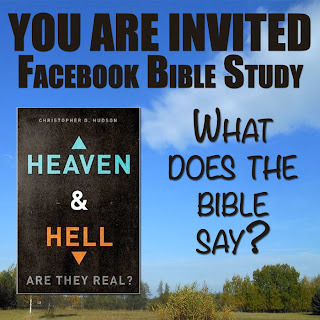 Would you join me for a Facebook Bible Study on Heaven and Hell? On Sunday, February 2 I am beginning a 6 week Bible study on the topic of Heaven and Hell. The goal of the study is to dig deeper into what the Bible says about each topic. Are you interested? If so, you can join me by signing up here. How do I complete the readings?Once in the private Facebook group, you'll get notifications when new readings are posted (usually Sundays and Thursdays). You can log in on your own schedule, complete the reading and answer the posted question. I would also encourage you to sign up for email reminders whenever a new reading is posted. You can sign up for that email list here. What do I need for the group? Nothing. Everything is provided in the private facebook group. What is the study based on? The study is based on my new book Heaven & Hell: Are They Real?, which comes out this next month. I'm drawing the readings and background information from that book, but you don't need it to participate. 3. Honor one another above yourselves. Other than that, let's learn together. The philosophy of this group is to encourage Christian growth by reading the Bible together. As long as you fit that goal, you are welcome in the group. Sign up by requesting to join the group here. That short question has a long answer. Here you go.